It’s sneak peek recipe time! 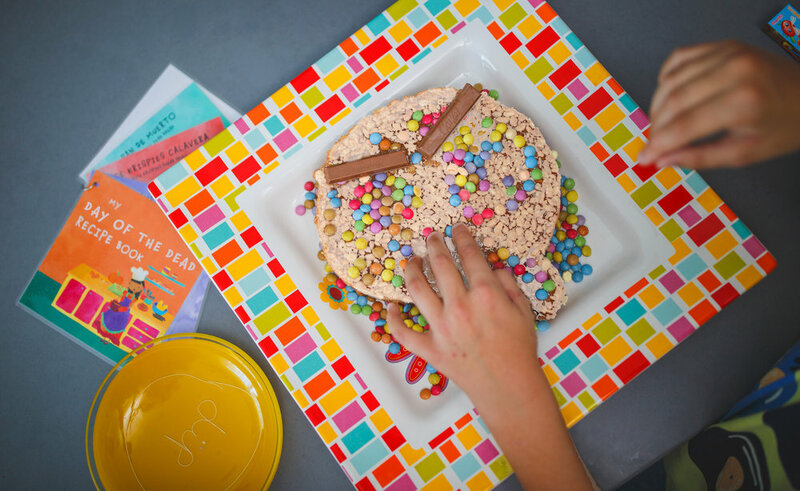 Today we’re making…Rice Krispies Calavera! We love sweets. We love creative designs. We’re super excited about the Day of the Dead. And we love having fun in kitchen! 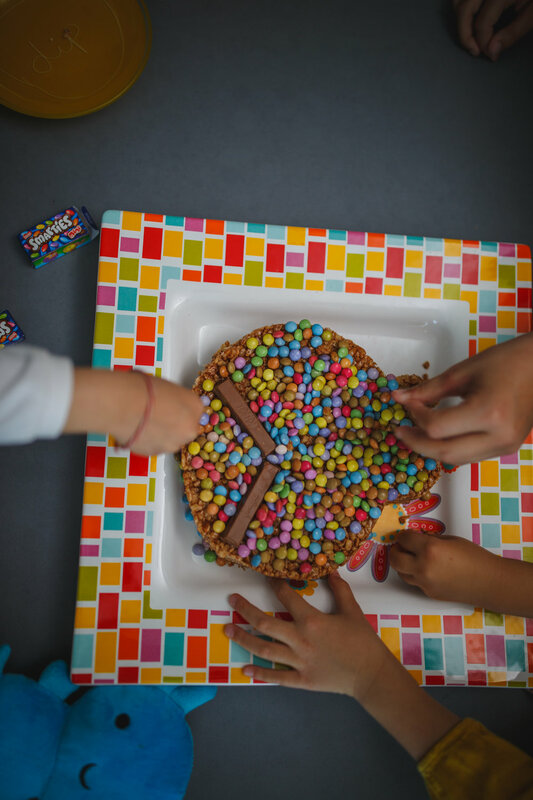 Put 2 and 2 together, and today, you’ll find us in the kitchen making this yummilicious Rice Krispies Sugar Skull from the recipe book that can be found in our Mexico Story box. It’s fun, straightforward and seasonal. Did we mention it’s delicious? And since we’re feeling super generous, we’re sharing our recipe below! Take a look… and then maybe also take a bite! Any edible decoration you like! Place the butter in a large saucepan and melt it over low heat. Add the marshmallows and stir until they are completely melted and blended. Take the pan off the heat and immediately add the Rice Krispies cereal. Mix lightly until the cereal is lightly coated. Use a pyrex (around 13x9 inches) and cover it with cling film or aluminium foil. Alternatively, grease with cooking oil. Draw a skeleton head on wax paper and then cut it out. Place the skeleton stencil on top of the Rice Krispies mixture and cut around the skull shape, removing the excess pieces. Give your skeleton head a face by decorating ti with smarties, M&Ms, mini marshmallows, gummies and jelly beans, fruit loops, colored sprinkles, royal icing, sugar cookies, anything else that comes to mind! 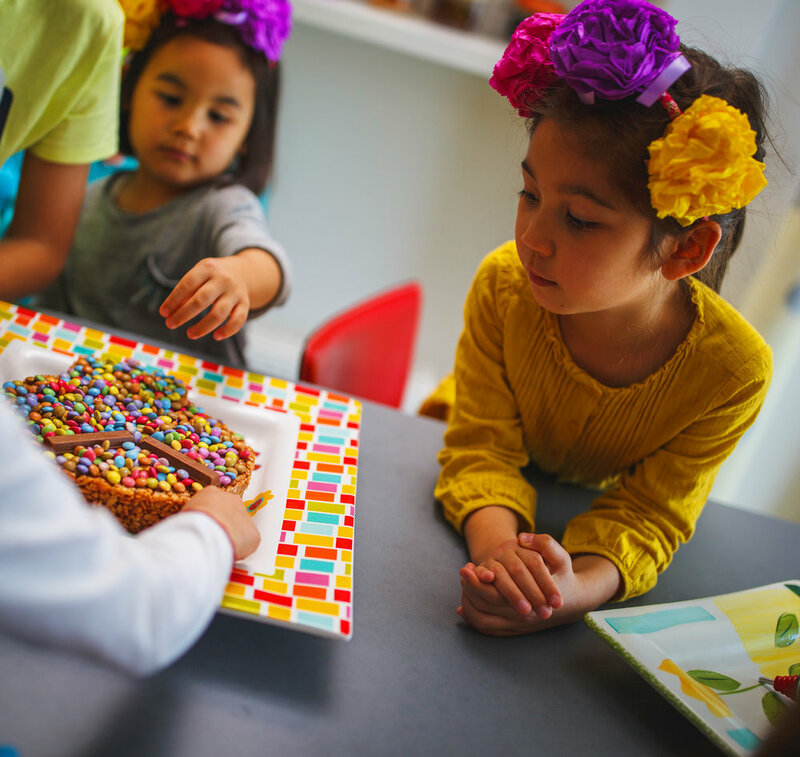 Looking for more Day of the Dead inspired recipes to make with your little ones at home? Our Mexico story box can definitely come to your rescue! Older PostMexico Story Box Giveaway! Test your knowledge and win!